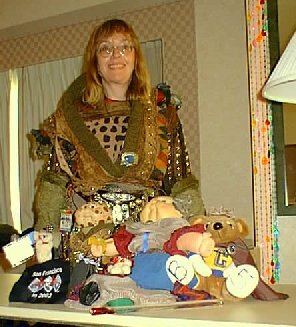 Here are some shots from my trip to Westercon 50 in Seattle. For some inexplicable reason they nearly all seem to feature members of the SF2002 team. Just in case you don't know, most of our parties feature a "Summer of Love" theme, which may help to explain some of the weirdness. The SF2002 team arrive in style. 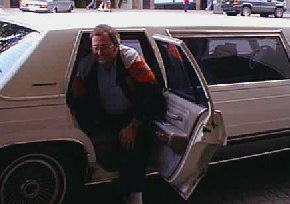 Bid chair Kevin Standlee exits our limo. 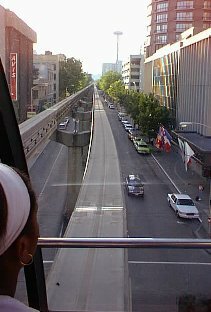 The view from the Seattle monorail. 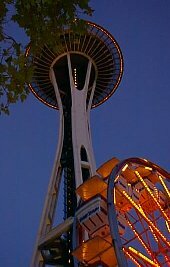 The Space Needle by night. Kevin helps prepare for the party. Yes, that apron is mongrammed with the bid logo. 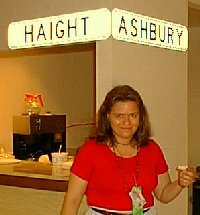 Party co-ordinator, Lynn Gold, at the corner of Haight and Ashbury. Lynn, Mary Kay and Crickett's birthday cake. The sponge inside had a tie-dye pattern. 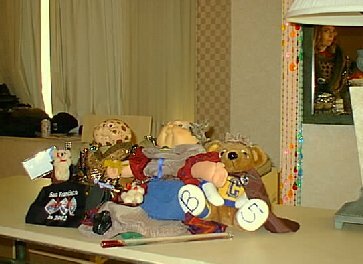 Shirl Roth's B5 dolls go on display whilst a proud Mom looks on in the mirror. I couldn't have managed that shot if I'd planned to do it.